Could Solar-Thermal Power Supply 25% of the World’s Needs by 2050? A report by Greenpeace and two solar thermal industry groups say yes, but major hurdles – money and policies – stand in the way of it becoming a reality. Solar-thermal power advocates have long claimed that the technology could deliver lots of solar electricity cheaply. So it's no surprise that a report issued by Greenpeace and two solar industry groups says solar-thermal power farms could provide up to 7 percent of the world's electricity needs by 2030 and a quarter of them by 2050. That's the most aggressive scenario created by the report's authors and assumes that solar power plant developers are able to obtain ample investments and the right government policies. The solar-thermal power industry could spend about 2 billion euros ($2.80 billion) in building solar power plants this year, the report said. If investments jump to 39.7 billion euros ($51 billion) per year by 2020, 89 billion euros ($51.4 billion) per year by 2030 and 174 billion per year ($224 billion) by 2050, the world could see 1,500 gigawatts of solar thermal power plants by 2050, said the reportedly, which was jointly issued by the European Solar Thermal Electricity Association and SolarPaces (part of the International Energy Agency). 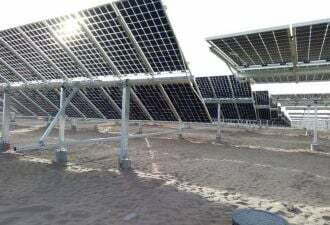 Solar thermal technologies use a field of mirrors to concentrate the sunlight to heat up water or oil and generate steam for power production. 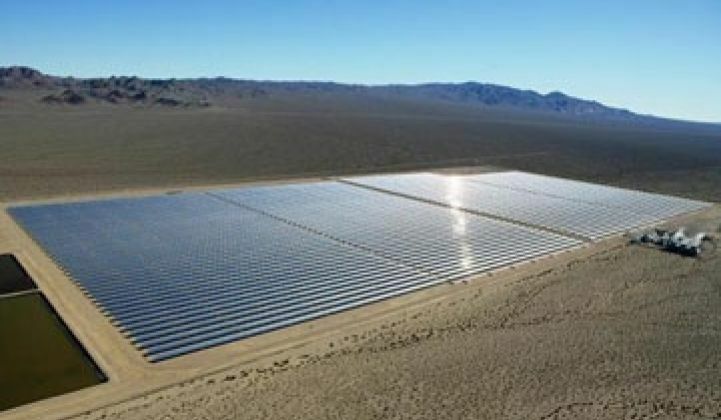 Solar thermal power plants also typically are located in remote area because they require a lot of land to accommodate the thousands of mirrors, in addition to the power generation facility. Part of the appeal also lies in their ability to store the heat, which could reach more than 1,000 Fahrenheit, in a storage tank containing molten salt and use it to generate electricity at night. Companies such as Abengoa Solar, Acciona, Solar Millennium and BrightSource Energy have all been developing solar thermal power plants in Spain and the American Southwest. Few solar thermal power plants have been built in recent years worldwide, however, because doing so requires a lot of land and money. About 80 percent of the costs go into building a power plant, with the remaining 20 percent for operating it, the report said. Getting government permits could take a year or more. Utilities are warming up to solar thermal power technologies chiefly because when those solar farms are built in large scale, as in hundreds of megawatts, they can be cheaper than power plants built with solar panels or other technologies. Utilities are cost-conscious and under state mandates to embrace the more expensive solar, wind and other clean technologies. Arizona Public Service Co. (APS), for example, announced last week that it would buy power from a 290-megawatt solar power plant to be built by defense contractor Lockheed Martin and financed by Starwood Energy Group. The project reportedly would cost $1.5 billion. APS also has agreed to buy power from a 280-megawatt solar thermal farm to be constructed by Abengoa Solar, which recently completed and began operating a 20-megawatt solar-thermal power plant (with 1,255 mirrors) in its native Spain. Although solar thermal power companies are making good progress in developing power plants and securing contracts, they remain an emerging sector in the solar industry, in which more solar panel-based systems are installed globally. In 2008, no new commercial solar thermal power plants came online in the United States, said the Solar Energy Industries Association (SEIA) in Washington, D.C. More than 6 gigawatts of projects are currently under development, the SEIA said. Greenpeace's report acknowledged that the solar thermal power sector could fall short of its promise in delivery cheap solar power in the next four decades. It used data from the International Energy Agency's 2007 outlook to devise a least aggressive scenario, which assumes no future policies that would be boost solar thermal power growth. Under this scenario, the world's solar thermal power capacity would reach 7.3 gigawatts by 2020 and 18 gigawatts by 2050. That means solar thermal power would only make up 0.2 percent of the global power supply by 2050, the report said. In a more moderate scenario devised by Greenpeace's report, solar thermal power could supply up to 1.2 percent of the world's electricity needs by 2020 and up to 11.8 percent by 2050. That would mean installing 68 gigawatts of production capacity by 2020 and 830 gigawatts by 2050.